This cabin was built new in 2011 and this modern home has 3 bedrooms, 2 baths, a gas fireplace, WIFI, a washer/dryer, dishwasher and a garage. The high grade finishes and a great floorplan make this one of our most loved cabins. In the rear is a covered patio and yard that is right on the Wallowa River and is a great place to have a family BBQ! This cabin sleeps 8 people, although this cabin is adjacent to River View 1, which could also be rented to increase your group capacity to 14 people! 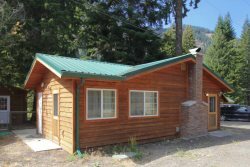 Come enjoy Wallowa Counties' many activities while staying at this neat cabin by the river! Go on a hot air balloon ride in the morning, go up the tram and have lunch, or just enjoy the lake and all the other incredible activities there are! This cabin is also a short walk away from many restaurants, go carts, horseback riding, miniature golf, and more! Bring your friends and family to one of the Seven Wonders of Oregon and stay in this luxurious cabin!